Description: Jacob is a young boy who loves to be playful, but when he is given the responsibility of being the village shepherd his wild imagination leads him astray. This delightful re-imagining of one of Aesop's most loved fables is brought to life with Angel Heart's impeccable combination of exquisite puppetry, dynamic storytelling, beautiful live music and the chance to join in. Angel Heart Theatre are dedicated to The Art of Puppetry and Storytelling, creating original stories and re-imagining familiar tales with a visually striking, innovative style. Touring Dorset with Artsreach, the county's touring arts charity. 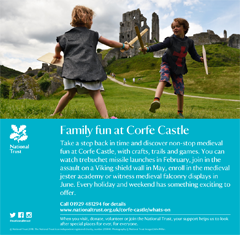 Suitable 3+ AAdult	£8.00 per ticket Child	£5.00 per ticket Please let us know you saw us on What's On in Dorset!